1. Superiority complex. The question itself reveals an unexamined adherence to our dominant culture’s belief that humans have a natural right to exploit other species — a sense of “privilege” ingrained in us since childhood. So to understand the answer, you must first be willing to question your most basic assumptions about our relationship with animals — namely the belief in human superiority and consequently the inferiority of other animals who are said to possess no other purpose or value than to serve as our resources. 2. Sentience. Regardless of what emotion we feel toward an animal — whether it be love or hate or indifference — that animal is a sentient being, that is, able to sense physical and psychological states of pain and pleasure, in the same way we do. The fact is, an individual animal cares about what happens to him or her, regardless of what we think of him or her. We know with certainty that all birds, mammals, fish and many other marine animals are sentient, according to the best science we have and as evidenced from first-hand observation. 3. Objectification. Referring to an animal as “meat” strips her of her true identity and reduces her to a mere product for consumption. “Meat” is the language of objectification — an attempt to turn a someone into a something. We know perfectly well that animals are not inanimate objects; they are sentient beings with specific interests, emotional states, desires and subjective awareness. Referring to animals as “meat” disconnects us from the reality of the animal and thus disconnects us from the reality that certain food choices exploit and harm animals. 4. Justice. When we bestow upon some animals love and empathy and other animals disdain or indifference, it reveals more about our own prejudices than about the intrinsic worth of the species we are judging. Laws prevent us from discriminating against or enslaving our fellow humans based on race, color, religion, sexual preference, or gender, but there are no laws protecting animals from our discrimination and exploitation against them. The only reason we get away with speciesism is because it is socially- and culturally-acceptable. But when we look critically at our widely-held belief in speciesism, we can find no just, moral or rational basis for concluding that a member of another species is inferior to us simply by virtue of being a different species. Moreover, speciesism is inconsistent with the value we place on the Golden Rule: Treat others as you would like to be treated. Therefore, eating animals disconnects us from our core values. 5. Might does not make right. Eating “meat” is a symbol of human power over powerless sentient beings. 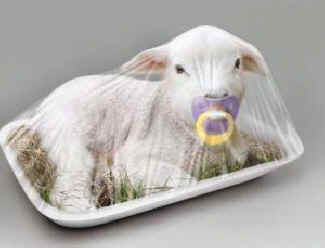 Meat-eating feeds our ego at the expense of and violation of others. We do not eat “meat” today out of necessity because, unlike certain species, we are not obligate carnivores. We eat “meat” by choice, for the satisfaction we get out of it (and, in some cases, from mistaken beliefs about nutrition). If you claim to care about animals, then you cannot morally defend causing them suffering and death just to satisfy some fleeting, trivial pleasure you get in eating them. Instead, you would defend, at the very least, their basic right to sovereignty over their own bodies which would protect them from being exploited by humans for trivial reasons that are, for them, literally a matter of life and death.